“St. Botolph’s, otherwise known as ‘Boston Stump’ is a very special place and I hope you catch a sense of that as you visit us. The beauty of the building is breath-taking. We are inheritors and custodians of an extraordinary vision which could imagine and build something of this scale and grandeur. There is so much here which makes us marvel, admiring human ingenuity and the faith which motivated it. Come and climb 209 steps for the Tower Experience and then visit the Coffee Shop & Gift Shop or reflect in our sacred space. The kids will love our Treasure Trail & Play Den! St Botolph’s Church is open daily and is free to enter although charges do apply to the Tower Experience. Daily deals are available from the Coffee Shop with Soup being served on Wednesdays and Saturdays throughout the year. Tours are offered, for more information please see here. St Botolph’s welcomes everyone, including your pets! We are an Animal Friendly (Anglican Society of the Welfare of Animals) Church and a member of the Inclusive Church network. We are free to enter and are open everyday. The Boston Stump Gift Shop sells a great range of reasonably priced gifts and Boston souvenirs. All the proceeds raised through our shop goes towards ensuring that we can continue to keep our doors open every day throughout the year. For more information, please contact the Shop Manager either via adam.kelk@parishofboston.co.uk or call (01205) 310929. Help to build our 100,000 piece replica model of St Botolph’s. Each brick costs £1.00 to sponsor with all the money raised contributing to our educational & community work. Simply pay your sponsorship money in our Gift Shop and then place your brick! For more information please contact the Parish Office either by contacting admin@parishofboston.co.uk or calling (01205) 310929. Alternatively, you can pay via the website through the dedicated Lego page, here. There is a £5.00 charge for over 18’s, with children going free accompanied by an adult. The climb is not an organised tour, visitors climb on their own. Please note: We do have to close the tower climb should there be a Church Service taking place or due to adverse weather conditions. If you wish to check before making the journey, please call (01205) 354670. Due to the reordering and restoration work being undertaken through our National Lottery Heritage Funded project, A Passion for People, the tower is currently closed until further notice. 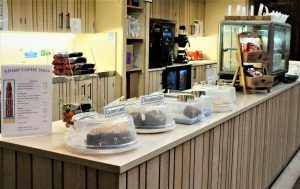 The Stump Coffee Shop serves a good selection of hot/cold drinks, sandwiches and cakes throughout the week. Hot food is offered on Wednesday, including locally sourced sausages, sausage rolls and a variety of other specials. The Coffee Shop now stocks a good range of Vegan and Vegetarian foods along with Gluten and Lactose Free products. Due to the reordering and restoration work being undertaken through our National Lottery Heritage Funded prokect, A Passion for People, the Coffee Shop is closed on Monday’s. St. Botolph’s Church, often known as ‘Boston Stump’, is spectacular from outside and in and is described by Pevsner as a ‘giant among English Parish churches’. 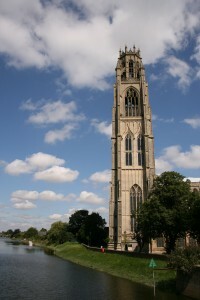 Boston Stump has always been a landmark to both seafarers and people travelling across the flat fenland that surrounds the town. Replacing an earlier Norman church, construction of the present building commenced in 1309 at the east end and was completed by 1390, apart from the tower. The tower construction was started in 1425-1430 but not completed until 1510-1520. The Chancel was originally only designed to be three bays long but was lengthened by two additional bays to the east, possibly because of the growing importance of commercial and religious life of the town. In post reformation times there has been remodelling of the interior of the building. With some minor exceptions, the exterior has remained much as it would have been at the time of the reformation. Internally a major programme of work remodelled the church with box pewing, a timber and plaster vault and a sweeping away of the medieval screens, rood and seating arrangements. The interior of the church now largely reflects two significant periods of restoration, in the mid 19th century and in the second decade of the 20th Century. Over its 700 years the church has played its part in both national and international history. It will be forever linked through the puritan emigrants who in 1630 followed in the wake of the Pilgrim Fathers and founded a new Boston in the United States of America. The size of which has long since surpassed Boston in Lincolnshire, but the close links are never forgotten.